Theory of mind (ToM) – our ability to understand the underlying mental states of other people – is a fundamental human capacity for communication and social activity across different language systems. ToM has been tested in typically and atypically developing children with a variety of paradigms. Among them, a false-belief task is the most commonly used . In a typical false-belief task, dubbed the “Sally-Anne” task, a toy is moved by a protagonist, Anne, while another protagonist, Sally, is absent, so that Sally mistakenly believes the object is still in its last location, while the all-seeing Anne knows it is now somewhere else. Children are asked, when Sally comes back where she will look for the toy [2, 3]. A large volume of research across different language systems indicates that ToM develops sometime between 2.5 and 5 years of age in typically developing children . However, false-belief acquisition lags behind significantly in children with autism spectrum disorders (ASD) [5, 6] and other atypical developmental conditions including specific language impairment  and deafness [8,9]. It has long been debated whether or not a person has to have sophisticated language skill in order to have ToM capacity. Some argued that mindreading / ToM precedes language in development (e.g., [10-13]), while others posited that language development is a necessary precursor for ToM reasoning (see refs. below). For instance, Fodor  argued that humans possess a rich, propositional representational system which we share with non-human primates, and which is different from natural language. However, across many studies, significant relations between language ability and children’s performance on false-belief tasks have been found in both typically [14-16] and atypically developing children / adolescents [5-7]. De Villiers and her colleagues argued that people need sophisticated grammar, especially ability to understand the complement embedded in the false-belief sentences to develop ToM (e.g., ). A recent meta-analysis of more than a hundred studies that examined the relationship between language and ToM supported this so-called “linguistic determinism” hypothesis of de Villiers and her colleagues because they found significant correlation between ToM and syntactic and semantic language measures used in these studies . However, the meta-analysis was limited in that it failed to delineate the causal directions involved in the relationship and the applicability of the relationship across different language systems since the analysis excluded studies on non-English speaking populations. It was also limited in that it did not take into account possible effects of pragmatic aspects of language on ToM. This is a major limitation of the meta-analysis given the increasing evidence that at least in people with ASD, pragmatics (not syntax or semantics) largely account for their impairment in ToM [19, 20]. Neurological evidence for or against linguistic determinism is still in its infancy. An aphasic patient with a wide left-hemispheric damage showed intact ToM performance while failing syntax-related tasks . Also, it has been found that processing of pragmatically coherent sentences alone (without ToM) activates the medial prefrontal cortex (mPFC)  that has been most consistently implicated in brain imaging studies of ToM . Recently, through a series of functional brain imaging experiments in Japanese and American / English speaking adults and children, my colleagues and I demonstrated that ToM is subserved by different areas of the brain depending on the language used in the task [24, 25]. However, at least the differences in brain activity when the participants viewed the same story-based false-belief task in English and Japanese and the same cartoon-based false-belief task may reflect non-syntactic / -semantic aspects of language. These results suggest that constitutive aspects of language (e.g., grammar) may function merely as a “co-opted” system (see ), but pragmatic aspects of language (e.g., mode / attitude and reading communicative intentions) may profoundly affect ToM throughout development. This article aims to review; 1) results of behavioral studies that examined the relationship between language and ToM, 2) results of neurological case studies and functional brain imaging studies that examined this relationship. This review particularly focuses on results from a series of cross-linguistic functional magnetic resonance imaging (fMRI) experiments on neural basis of ToM that my colleagues and I reported [24, 25]. Finally, I discuss current limitations and future directions of research of the relationship between language and ToM. If language is necessary for ToM, it follows that preverbal infants do not understand ToM. Several recent studies in infants showed that it is not the case. It has been shown that precursor ability (e.g., joint attention, imitation and pointing gestures) of ToM is present early in infancy (e.g., [27-29]). A series of recent studies that used looking-preference paradigms found that even 13-15 month-old infants have the capacity to understand ToM [29-31]. Even though these results and methods used in the false-belief experiments on infants are still debated (see for example, Perner and Ruffman  for the criticism of Onishi and Baillargeon’s  study), evidence from studies on precursor abilities (see above refs.) of ToM seems to be convincing. The above results imply that nonverbal ToM precedes verbal ToM developmentally and if so, nonverbal false-belief tasks are easier than verbal ToM tasks. However, mixed results were obtained on this account. In several studies that compared children’s performance in verbal and nonverbal false-belief tasks, children performed better [33, 34], the same [35, 36] or worse [37, 38] in the nonverbal false-belief tasks. For instance, in Call and Tomasello  the helper watched the experimenter hide a sticker in one location. When the helper left the room the experimenter moved the sticker from that location to another. Children were asked which box the helper might indicate as containing the sticker. In this experiment, both verbal and nonverbal conditions were acted out with no verbal description, but only the test question in the verbal version was verbal. Children’s performances in the two versions were comparable. Later, Lunn  tested children with the same task as Call and Tomasello and this time children performed better in the nonverbal task than the verbal one. Given these results, evidence in support of the linguistic determinism hypothesis is equivocal at best. As several ToM researchers suggest [16, 39], language may be important for ToM not because language is a prerequisite for ToM but because it is used as “scaffolding” for symbolic representations. While implicit nonverbal ToM may not involve any language, there is relatively little doubt that language is involved in explicit verbal ToM, especially in the false-belief reasoning . However, the extent of the involvement and what aspects of language are the most involved are much in debate. As I mentioned in the introduction, the strong linguistic determinism of ToM posits that language is prerequisite for ToM (e.g., ). De Villiers and her colleagues argue that children’s mastery of syntax, especially the sentential complement (e.g., “Sally says that…”) is necessary for ToM development. In this view, other aspects of language (i.e., lexicon, semantics, and pragmatics) are marginalized. More recently, P. de Villiers  has elaborated this hypothesis and argued that the mastery of sentential false-complements with communicative verbs plays a central role for explicit ToM reasoning. However, most of the evidence that supports this claim came from their own groups’ research (e.g., [17, 37, 41]). For instance, in their studies of oral deaf children and ASL-learning deaf children, children’s performance of the complement comprehension task predicted their performance on both standard and low-verbal false-belief tests (40). However, a close examination of the results of this study shows that children’s mastery of vocabulary (p = .005), and not the false complement clauses (p = .039) is a stronger independent predictor of their false-belief performance. Given these results, it seems unreasonable to maintain that the mastery of false-complement is the best predictor of false-belief reasoning. Moreover, in Lohmann and Tomasello , training children with discourse without sentential complements improved their false-belief task performance. Furthermore, a recent meta-analysis of over a hundred of studies that explored the relationship between language and ToM have demonstrated that various aspects of language (i.e., semantics, syntax, receptive vocabulary memory for complements, and general language) all predict ToM reasoning . The evidence described above seems to increasingly support that the strong linguistic determinism is untenable. However, fortunately there is another moderate version of linguistic determinism that emphasizes the influence of the socio-linguistic effects on ToM [43-46]. It follows Vygotsky’s theory  and posit that it is the social-cognitive ability embedded in culture-specific symbolic systems (i.e., social languages) that enables children’s ToM. Its emphasis is not on constitutive aspects (e.g., syntax and semantics) but socio-communicative or pragmatic aspects of language [43, 46]. Bruner regards culture-specific meaning-making process as a central force for development of ToM or folk psychology . Similarly, Nelson posits that ToM is best described as a Community of Minds that is enabled through internalization of language . The Community of Minds is not universal and each person develops his / her own Community of Minds depending upon his / her background, personality, relationships, and history. Intuitively, the pragmatic aspects of language are strongly associated with ToM because pragmatics assumes that both verbal and nonverbal communications are the expression of context-specific intentions [48, 49]. In support of this hypothesis, it has been found that individuals with ASD are most impaired in the pragmatic aspect of the language [19,50]. It has also been suggested that the way in which older children / adolescents with ASD approach false-belief tasks is different from typically developing children in that they rely on syntax and semantics more than pragmatics which seems to be lacking in people with ASD . The lack of pragmatics, and therefore, lack of ToM is evident in children with autism in their learning style of novel words. Baron-Cohen and his colleagues found that children with ASD learned new words whenever they themselves attended to the focal object whether or not the adult also attended to it, but the normally developing preschool children did not learn the new words unless the object was jointly attended to by another person . Unfortunately, Milligan et al.’s meta-analysis  excluded those studies that examined the relationship between pragmatic aspects of language and those that tested non-English speaking children. An earlier meta-analysis that examined over a hundred ToM studies (including studies that tested non-English speakers) found that the basic course of development is the same across different language systems . Children across different language systems passed false-belief tasks between 2.5 and 5 years of age. However, since many of the studies included in the meta-analysis did not examine the relationship between language and ToM and since most of these studies tested children in English speaking countries, the meta-analysis is relatively uninformative in terms of the possible effects of the linguistic variation on ToM. More recently, Collaghan et al. tested children in Canada, India, Peru, Thai, and Samoa with a single false-belief task and found no difference among these children in the passing age of the task. However, the same limitation as the above Wellman et al.’s study  applies here. Since this study did not use any specific language measures pitted against ToM measure, little information is provided on the relationship between language and ToM development. Fortunately, there are a number of studies that tested non-English speaking children with specific linguistic measures / hypotheses. Several of these studies found effects of language on ToM development (e.g., [54-56]). For instance, Junin Quechua children performed poorly on ToM tasks relative to American / European (A/E) children presumably because of their lack of mental state verbs . In Lee et al.’s study with Mandarin-speaking children, even though the children’s performance for the false-belief task was comparable overall to A/E children’s performance, their performance was influenced by the choice of verbs (i.e., three verbs that all mean “think”) used in the false-belief task . Mandarin-speaking children performed significantly better when yiwei and dang, which connote that the belief referred to may be false, were used than when xiang (the more neutral verb) was used. In a study in Turkish and Puerto Rican (PR) Spanish-speaking children, advancement in ToM performance was found . In this study, the Turkish or PR Spanish-speaking children, who have either a specific verb (Turkish) or a case marker (PR Spanish) available to make the false-belief mental state more explicit, performed better than Brazilian Portuguese or English-speaking children who do not have those lexicons. As I mentioned earlier, linguistic determinism theory posits that children’s successful mastery of complements is necessary for successful performance in the false-belief task . However, it has been found that English-speaking children pass the false-desire task significantly earlier than they pass false-belief tasks (e.g., [57, 58]). To this, P. De Villiers explains that the false-desire task is easier for children because it takes the to+complement (e.g., “X want to…”), while false-belief task is harder because it takes the that+complement (e.g., “X believe that…”) . If this claim is true, German-speaking children should perform equally well in the false-desire and false-belief tasks because in German the desire verb, wollen (want) also takes the that+complement form. However, a study found that it is not the case . German-speaking children still performed better in false-desire (using “want” verb) task than the false-belief (using “believe” verb) task. More importantly, in this experiment, no correlation was found between children’s use of that+complement and their performance in the false-belief task after verbal IQ and age were accounted for. Similarly, Cheung et al. examined whether or not Cantonese children’s mastery of syntactic aspects of language (more specifically, false-complements) uniquely predicts the children’s false-belief understanding. Contrary to this hypothesis, neither syntax nor verb semantics but children’s general language ability (measured by TELD-3 ) was the best predictor of ToM performance. Thus, my prediction was that if the false-complement structure influences the false-belief understanding Japanese children (who were all balanced bilinguals) would perform worse in the same second-order false-belief task in Japanese (L1) than in English (L2). Contrary to this prediction, there was no effect of language. Japanese children’s performance on the Japanese false-belief task was comparable to their performance on the English false-belief task. These results are consistent with the most recent study that tested Japanese children with the second-order false-belief task . In this study, despite the significant developmental delay in the first-order false-belief task (see also [66, 67]), Japanese children’s onset of the second-order false-belief task was about the same as the A / E children’s (i.e., between 6 and 9 years old [68, 69]). These results clearly show that mastery of that+complement is not necessary for ToM understanding at least in several non-English speaking cultures. In sum, the above evidence suggests that although it is undeniable that language ability is necessary for developing explicit ToM because it provides scaffolding to think and interpret other people’s intentions and actions, language may not be sufficient for the expression of ToM. Moreover, it may not be the syntactic or semantic aspects of language that is the most important for ToM. Contrary to the strong linguistic determinism, the currently available data suggest that it is pragmatic aspects of language that is the most essential for ToM development. Thus, evidence so far supports the second moderate version of linguistic determinism. Compared to behavioral or developmental evidence, neurological evidence to support or negate the developmental relationship between language and ToM is still scarce. However, evidence from developmental ToM studies described above suggests that pragmatic aspects of language are the greatest importance for ToM expression. It has been established that in human adults syntactic and semantic aspects of language are specialized in the left hemisphere of the brain (e.g., [70, 71]), while pragmatic aspects of language are specialized in the right hemisphere of the brain (e.g., [72, 73]). For instance, in Winner and Gardner’s study, RHD patients have been observed to choose a literal translation for a metaphorical sentence more frequently than healthy controls . Several studies clearly showed that right hemisphere damaged (RHD) patients have problems with understanding non-literal language, metaphors, and jokes while they have no trouble in understanding literal language (e.g., [72, 75]). It has been found that left hemisphere damage (LHD) patients often perform as well as healthy controls in ToM tasks [21, 76-78], while RHD patients perform worse than LHD patients . For example, Siegal et al. tested both RHD and LHD patients with the standard Sally-Anne style false-belief task. RHD patients failed, whereas LHD patients passed the test. Similarly, in a lesion study, a LHD patient, PH, performed almost perfectly on nonverbal second-order false belief task, while he failed grammatical language tests . Most recently, Champagne-Lavau and Joanette  observed a co-occurrence of ToM impairment and deficit in pragmatic language in a group of 15 RHD patients. These results from lesion studies are consistent with the findings from behavioral studies and suggest that constitutive aspects of language or at least grammar are less important for ToM than pragmatic aspects of language. Lesion studies are, although informative, less specific about the brain areas involved in the aspects of language and their relationship to ToM. In order to determine precisely which brain regions are important for explicit ToM and language, researchers most commonly rely on data from brain imaging studies. The classical language regions encompass Broca’s area or Brodmann area (BA) 44/45 in the inferior frontal gyrus (IFG), Wernicke’s area in the superior temporal gyrus (STG), the angular gyrus, and supramarginal gyrus (SMG) . There is now a broad consensus that syntactic processes are subserved by the left STG and the IFG (specifically, BA 44 and frontal operculum) in adults [70, 71, 83]. Semantic processes, in contrast, are found to be supported by the left middle temporal gyrus, the SMG, and BA 45/47 in the IFG in adults [84, 85]. 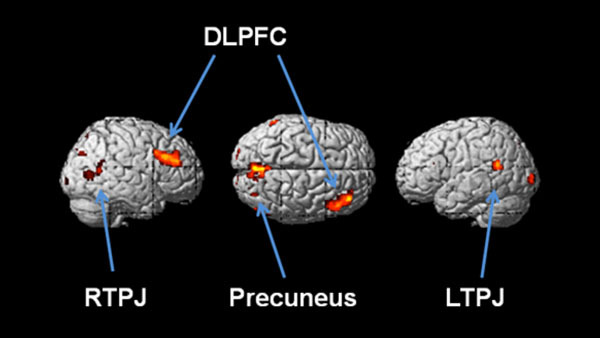 Brain imaging studies that examined relationship between language and ToM are still scarce, but an fMRI study found that adults employ medial prefrontal cortex (mPFC), which has been the most consistently implicated in ToM brain imaging studies across studies , for processing pragmatically coherent stories . More recently, my colleagues and I tested Japanese-English bilinguals with a second-order false-belief task (see above), using fMRI (, see also  for example stimuli and methods). During L1 (Japanese) compared to L2 (English) ToM story condition, more activity in the bilateral dorsolateral prefrontal cortex (DLPFC) was seen. During L2 (English) compared to L1 (Japanese) ToM story condition, more activity in the left precentral gyrus and caudate nucleus was found. Since these two story conditions were matched in semantics and syntactic difficulty (see above), these differences in brain activity are most likely accounted for by pragmatic difference between Japanese and English. Difference in brain activity was also seen while Japanese and American participants performed the same nonverbal cartoon ToM task which was also in the second-order false-belief format. During the cartoon task, compared to Japanese adults, American adults activated the left postcentral gyrus, right mPFC, posterior cingulate cortex, and anterior cingulate cortex. Compared to American adults, Japanese adults activated the right putamen more [see  for more detailed results]. Compared to those in adults, brain imaging studies of language in children are still too scarce to reach a broad agreement on the specialization of those linguistic processes in the different areas of the brain. But increasing evidence suggests that language is less lateralized and involves broader regions in children than in adults . In contrast to what Saxe  described as “exploded” ToM brain imaging studies in adults those in children are still numbered, but several studies examined neural basis of ToM or related social cognitive functions in children [25,88-93]. However, in many of the studies, ToM (or related social cognition) task specific activity in the aforementioned language regions has been observed (for detailed discussion see ). For example, significant activity in the IFG was found while children were engaged in facial imitation , story and cartoon-based irony [90, 91] and ToM tasks [25, 93]. So far, our study is the only brain imaging study that has compared adults and children in false-belief task related neural activity and we found difference in false-belief specific activity between the age groups in some of the language areas (see above) including the right IFG (BA 47) and left STG (BA 62). Children activated these regions more than adults . Furthermore, we found similar differences in ToM-specific brain activity between 8-12 year-old Japanese and American children  to those between Japanese and American adult . In this experiment , American children activated the right TPJ more than Japanese children who activated the left STS and right IFG more while they performed the same cartoon based ToM task, although the significance levels were less (p-values were more) than what are normally expected in fMRI experiments in general. What pragmatic aspects between the two groups account for the differential brain activity remains to be tested, but it has been observed that Japanese use indirect expression more than Americans to inform everyday communicative intentions [95, 96]. Also, a recent study found that Japanese children’s justifications of protagonists’ behaviors in ToM stories are less agent-centered and more interpersonal situation-centered than American children’s . Thus, any of these or other pragmatic / communicative differences might account for the above difference in the brain activity between the two cultural groups. Through a further analysis, we found the most convergence of ToM-specific activity (measured by ToM vs non-ToM conditions) between the Japanese and American adult and child groups in the right DLPFC (besides precuneus) for both verbal (story) and nonverbal (cartoon) versions of the task (Fig. 1; see also ), although in this analysis the bilateral tempro-parietal junction (TPJ) was also active, with the right TPJ being slightly more active than the left TPJ. Besides the mPFC, the TPJ has been implicated also most consistently across ToM brain imaging studies (e.g., ). These results, together with Saxe and Wexler’s results  which implicate the right TPJ specifically in mental state reasoning, indicate that the right-hemisphere pragmatic region of the brain plays a more important role for ToM than the left-hemisphere constitutive language region. Convergence of ToM-specific brain activity between American and Japanese adult and child (ages between 8 and 12 years old) groups. Convergent activity was found in the precuneus (x y z Talairach coordinate : -4 -60 38), right dorsolateral prefrontal cortex (DLPFC: 34 34 20), and bilateral tempro-parietal junction (TPJ: 53 -67 11 and -51 -53 19) through ToM minus non-ToM contrast (p < .0005 uncorrected: see also ). In sum, evidence from both brain lesion studies and neuroimaging studies of ToM has begun to converge to support the right hemisphere-pragmatics hypothesis of ToM. These results are again consistent with the account that pragmatic (not constitutive) aspects of language are necessary for the explicit ToM understanding. Several limitations of current research (both behavioral and neuroimaging) of relationship between ToM and language should be mentioned. One clear limitation is the paucity of neurological research that examined this relationship overall. Brain lesion studies are limited in that it is relatively rare to find individuals with localized brain lesions. For instance, RHD patients more often have lesions that encompass broad areas of the right hemisphere (see ). Thus it is difficult to examine more precise roles of particular areas of the brain. For these reasons more brain imaging research may be needed for drawing one-to-one correspondences between the target brain areas and ToM reasoning. Another major limitation is the scarcity of developmental neuroimaging research of ToM. As I discussed above, several brain imaging studies that tested children with ToM or social cognition tasks implicated several language regions of the brain [25, 88-93]. These results clearly indicate that some aspects of language are involved in ToM development. However, it is still unclear if pragmatic aspects of the language are the most important for ToM developmentally. In our study, the left IFG (BA 45) was recruited more while children performed the ToM cartoon task, but the same region was recruited by adults more while the adults performed the ToM story task . Since BA 45 is traditionally suggested to be involved in syntactic processing , more activation in this area may reflect children’s greater effort of constructing verbal meaning / syntax from nonverbal ToM. This results may be consistent with the finding that nonverbal false-belief tasks are not easier (or more difficult) than verbal false-belief task . Given these results it may still be arguable that some constitutive aspects of language are necessary for ToM development. But to confirm these results and to examine the developmental relationship between the neural basis of language and ToM more neuroimaging research in children is needed. Another clear limitation of research examining the relationship between ToM and language is related to a ToM theory called “theory-theory”. This theory maintains that ToM develops as scientists develop their theories and that ToM develops as children learn concepts of “desire” followed by concept of “belief” shortly after that . Aforementioned meta-analysis by Wellman et al. and more recent study by Liu et al. in Chinese speaking children in mainland China, Hong Kong, the United States, and Canada supported this theory by finding that even though onsets of ToM expression vary, children’s developmental trajectory of ToM was the same across cultures and language systems. The authors concluded that across cultures children develop desire-based ToM first followed by belief-based ToM understanding. However, since semantic and pragmatic aspects of language have so much to do with concept creation, it is difficult to tease apart concept-making from pragmatics. It may be that the universal developmental trajectory (found in  and ) represents more pragmatic development than conceptual development. Furthermore, since pragmatics is strongly tied to culture , it is inevitable that ToM research should take into account cultural variables. However, as Vinden  and Lillard [102, 103] pointed out, the standard false-belief task may not be valid for all cultures because many non- A/E cultures do not construe behaviors as personal and intentional. As I discussed above, Naito and Koyama  have shown that many Japanese children rarely give intentional desire based explanation to account for the false-belief of the protagonist. These results (together with Vinden’s results ) call into question the applicability of the developmental order of ToM concepts – from desire-based understanding to belief-based understanding. But to verity these issues and to separate conceptual development from pragmatic development, more cross-cultural / linguistic behavioral and neurological studies that compare among different conceptual and pragmatic development specific to the cultures and language systems are needed. Final limitation is that even though this review is about relationship between ToM and language, ToM may also involve other cognitive and / or affective faculties. It has been hypothesized that explicit expression of ToM requires not only language but also executive function [104-106]. For instance, Samson and Apperly and their colleagues [107,108] tested a brain damaged patient, WBA, with a nonverbal Sally-Anne style false-belief task adopted from Call and Tomasello . This task also differed from the conventional false-belief task in that the real location where the focal object was hidden was not revealed to the participants. In other words, the executive demand (to inhibit one’s own knowledge) was kept low. WBA performed above chance on this task despite failing the standard false-belief task. A criticism of their study, however, is that the adult characters in their false-belief movie task might have introduced deceptive cues for the object location . These criticisms aside, Samson et al.’s study is moving in the right direction. In order to discriminate the different factors that might affect ToM and to find the core component of ToM , to develop a ToM paradigm that has lower demands in executive function and language is a much needed task for the future research of ToM. Related to the above point, a few recent studies found more activation in the right TPJ when subjects reoriented their attention to any new stimuli indiscriminately relative to the baselines [109,110]. These results challenged the hypothesis that the right TPJ is selectively involved in ToM reasoning (see ). These results, however, have been contested by a more recent study that found only a small overlap between ToM-specific and attention-specific activations in the right TPJ . These conflicting findings of the brain imaging studies aside, it has been demonstrated that attention (in the form of joint-attention) plays a critical precursor role in early word learning and referential communication [112-114] and ToM development . Taken together, these results are consistent with Malle’s co-evolution hypothesis of ToM and language ; i.e., implicit ToM (e.g., referential communication and joint-attention) may precede language in evolution and development, but as children master language around 7 or 8 years old, language begins to exert greater effects on ToM. However, in order to delineate the precise developmental and evolutional sequence and relationship among language, attention, and ToM capacities and their neural correlates more neurological research in infants and non-human primates are needed. In this review I have discussed research on the relationship between ToM and language. Both behavioral and brain imaging research have begun to show evidence that there is moderate influence of language on ToM. Moreover, results of the studies discussed in this review suggest that pragmatic aspects of language affect ToM more than constitutive aspects. Since pragmatics and concept formation are tied to specific cultures, an important task of future ToM neuroimaging research is to define precisely what pragmatic / cultural factors are affecting ToM and examine these factors in systematic ways. The main stream theories of ToM all predict a culturally invariant core biological basis of ToM at least during early years in life (see ). Thus, another important task of cross-linguistic / cultural ToM brain imaging research is to find the core neural basis that remains relatively free from cultural and linguistic influence. I would like to thank Dr. Elise Temple and Dr. Michael Siegal for discussion, and Randall Frank for assistance. Baron-Cohen S. Theory of mind and autism: a fifteen years In: Baron-Cohen S, Tager-Flusberg H, Cohen D, Eds. Understanding other minds: Perspective from autism. 2nd. Oxford: Oxford University Press 2000; pp. 3-20. Baron-Cohen S, Leslie AM, Frith U. Does the autistic child have a “theory of mind”? Cognition 1985; 21: 37-46. Baron-Cohen S, Leslie AM, Frith U. Mechanical, behavioral and intentional understanding of picture stories in autistic children Br J Dev Psychol 1986; 4: 113-25. Wellman HM, Cross DC, Watson J. Meta-analysis of theory of mind development: The truth about false belief Child Dev 2001; 72(3 ): 655-84. Happé FGE. The role of age verbal ability in the theory of mind task performance of subjects with autism Child Dev 1995; 66: 843-55. Tager-Flusberg H, Jeseph RM. How language facilitates the acquisition of false-belief understanding in children with autism In: Astington JW, Baird JA, Eds. Why language matters for theory of mind. New York: Oxford University Press 2005; pp. 298-318. Miller CA. False-belief understanding in children with specific language impairment J Commun Disord 2001; 34: 73-86. De Villiers JG. Language and theory of mind: what are the developmental relationships? In: Baron-Cohen S, Tager-Flusberg H, Cohen D, Eds. Understanding other minds: Perspective from autism. Oxford: Oxford University Press 2000; pp. 83-123. Siegal M, Peterson CC. Language and theory of mind in atypical children: evidence from studies of deafness, blindness, and autism In: Sharp C, Fonagy P, Goodyer I, Eds. Social cognition and developmental psychopathology. New York: Oxford University Press 2008; pp. 79-110. Fodor JA. The language of thought. New York: Crowell 1975. Baron-Cohen S. Maindreading: an essay on autism and theory of mind. London: MIT Press 1995. Sperber D. Metarepresentations in an evolutionary perspective In: Sperber D, Ed. Metarepresentations: A multidisciplinary perspective. New York: Oxford University Press 2000; pp. 117-37. Malle BF. The relation between language and theory of mind in development and evolution In: Givon T, Malle BF, Eds. Evolution of language. Philadelphia: John Benjamins Publishing 2002; pp. 265-84. Astington JW, Jenkins JM. A longitudinal study of the relation between language and theory of mind development Dev Psychol 1999; 35: 1311-20. Hughes C, Dunn J. Understanding mind and emotion: longitudinal associations with mental-state talk between young friends Dev Psychol 1998; 34: 1026-37. Ruffman T, Slade L, Rowlandson K, Rumsey C, Garnham A. How language relates to belief, desire, and emotion understanding Cogn Dev 2001; 18: 139-58. De Villiers JG, de Villiers PA. Linguistic determinism and the understanding of false beliefs In: Mitchell P, Riggs KJ, Eds. Children’s reasoning and the mind. East Sussex, UK: Psychology Press 2000; pp. 191-228. Millgan K, Astington JW, Dack LA. Language and theory of mind: meta-analysis of the relation between language ability false-belief understanding Child Dev 2007; 78(2): 622-46. Landa R. Social language use in Asperger syndrome and high-functioning autism In: Klin A, Volkmar FR, Sparrow SS, Eds. Asperger syndrome. New York: The Guilford Press 2000; pp. 125-55. Tager-Flusberg H. Exploring the relationship between theory of mind and social-communicative functioning in children with autism In: Repacholi B, Slaughter V, Eds. Individual differences in theory of mind: Implications for typical and atypical development. London: Psychology Press 2003; pp. 197-212. Varley R, Siegal M. Evidence for cognition without grammar from causal reasoning and ‘theory of mind’ in an agrammatic aphasic patient Curr Biol 2000; 10: 723-6. Ferstl EC, von Cramon DY. What does the frontomedian cortex contribute to language processing: coherence or theory of mind? Neuroimage 2002; 17: 1599-612. Frith U, Frith CD. Development of neurophysiology of mentalizing Philosophical Transactions of the R Soc Lond B 2003; 358(1431): 459-73. Kobayashi C, Glover GH, Temple E. Cultural and linguistic influence on neural bases of ‘Theory of Mind’: an fMRI study with Japanese bilinguals Brain Lang 2006; 98: 210-0. Kobayashi C, Glover GH, Temple E. Cultural and linguistic effects on neural bases of ‘Theory of Mind’ in American and Japanese children Brain Res 2007; 1164: 95-107. Siegal M, Varley R. Neural systems involved in ‘theory of mind’ Nat Rev 2002; 3: 463-71. Meltzoff AN, Moore MK. Imitation of facial and manual gestures by human neonates Science 1997; 198: 75-8. Meltzoff AN, Brooks R. “Like Me” as a building block for understanding other minds: bodily acts, attention, and intention In: Malle BF, Moses LJ, Baldwin DA, Eds. Intentions and intentionality. Cambridge, MA: MIT Press 2001; pp. 171-91. Onishi KH, Baillargeon R. Do 15-month-old infants understand false belief? Science 2005; 308: 255-8. Song H, Baillargeon R, Fisher C. Can infants attribute to an agent a disposition to perform a particular action? Cognition 2005; 98(2): B45-55. Surian L, Caldi S, Sperber D. Attribution of beliefs by 13-month-old infants Psychol Sci 2007; 18: 580-6. Perner J, Ruffman T. Infants’ insight into the mind: How deep? Science 2005; 308: 214-6. Lunn JA. Is Call and Tomasello’s (1999) nonverbal false belief task a test of precocious mental state understanding? Paper presented at the Biennial Meeting of the Society for Research in Child Development 2003. Peterson CC. Drawing insight from pictures: the development of concepts of false drawing and false belief in children with deafness, normal hearing, and autism Child Dev 2002; 73(5 ): 1442-59. Astington JW, Baird JA. Representational development and false-belief understanding In: Astington JW, Baird JA, Eds. Why language matters for theory of mind 2005; 163-85. Call J, Tomasello M. A nonverbal false belief task: the performance of children and Great Apes Child Dev 1999; 70: 381-95. De Villiars P, Pyers J. Complementation and false-belief representation In: Almgren M, Barrena A, Ezeizabarrena M-J, Idiazabal I, MacWhinney B, Eds. Research on child language acquisition: Proceedings of the 8th Conference of the International Association for the Study of Child Language. Somerville, MA: Cascadilla Press 2001; pp. 984-1005. Norris R, Millan S. Theory of mind: new directions Social Psychology Seminar Cited by Plaut & Karmiloff-Smith 1993. Plaut DC, Karmiloff-Smith A. Representational development and theory-of-mind computations Behav Brain Sci 1993; 16: 70-1. Astington JW, Baird JA. Introduction: why language matters In: Astington JW, Baird JA, Eds. Why language matters for theory of mind. New York: Oxford University Press 2005; pp. 3-25. De Villiers P, Astington JW, Baird JA, Eds. The role of language in theory-of-mind development: What deaf children tell us Why language matters for theory of mind. New York: Oxford University Press 2005; pp. 163-85. Lohman H, Tomasello M. The role of language in the development of false belief understanding: A training study Child Dev 2003; 74: 1130-44. Brunner J, Ed. Acts of meaning. Cambridge, MA: Harvard University Press 1990. Vinden PG. Children’s understanding of mind and emotion: A multi-culture study Cogn Emotion 1999; 13: 19-48. Tomasello M. Perceiving intentions and learning words in the second year of life In: Bowerman M, Levinson SC, Eds. Language acquisition and conceptual development. Cambridge UK: Cambridge University Press 2001; pp. 132-58. Nelson K. Language pathways into the community of minds In: Astington JW, Baird JA, Eds. Why language matters for theory of mind. New York: Oxford University Press 2005; pp. 26-49. Vygotsky LS. Thought and language In: Hanfmann E, Vakar G, Eds. Trans. Cambridge, MA: MIT Press 1967. Grice HP. Studies in the ways of words. Cambridge, MA: Harvard University Press 1989. Sperber D, Wilson D. Pragmatics, modularity and mind-reading Mind Lang 2002; 17(1&2): 3-23. Frith U. Autism: explaining the enigma. Malden, MA: Blackwell Publishing 2003. Tager-Flusberg H. Evaluating the theory-of-mind hypothesis of autism Curr Dir Psychol Sci 2007; 16(6 ): 311-5. Baron-Cohen S, Baldwin DA, Crowson M. Do children with autism use the speaker’s direction of gaze strategy to crack the code of language? Child Dev 1997; 68: 48-57. Callaghan T, Rochat P, Lillard A, et al. Synchrony in the onset of mental-state reasoning Psychol Sci 2005; 16(5 ): 378-84. Vinden P. Junin Quechua children’s understanding of mind Child Dev 1996; 67: 1707-6. Lee K, Olson DR, Torrance N. Chinese children’s understanding of false-beliefs: The role of language J Child Lang 1999; 26: 1-21. Shatz M, Diesendruck G, Martinez-Beck I, Akar D. The influence of language and socioeconomic status on children’s understanding of false belief Dev Psychol 2003; 39(4): 717-29. Wellman HM, Woolley JD. From simple desires to ordinary beliefs: The early development of everyday psychology Cognition 1990; 35: 245-75. Wellman HM, Banerjee M. Mind and emotion: children’s understanding of the emotional consequences of beliefs and desires Br J Dev Psychol 1991; 9: 111-24. Perner J, Zauner P, Sprung M. What does “That” have to do with point of view? Conflicting desires and “Want” in German In: Astington JW, Baird JA, Eds. Why language matters for theory of mind. New York: Oxford University Press 2005; pp. 220-44. Cheung H, Hsuan-Chih C, Creed N, Ng L, Wang SP, Mo L. Relative roles of general and complementation language in theory-of-mind development: evidence from Cantonese and English Child Dev 2004; 73(4): 1155-70. Kobayashi C. Language and thought: cultural and linguistic influence on developmental neural bases of theory of mind PhD Thesis NY: Cornell University. 2007. Kimball J. Seven principles of surface structure parsing in natural language Cognition 1973; 2(1): 15-47. Mazuka R. Development of language process strategies. Mahwah, NJ: Lawrence Erlbaum 1998. Naito M, Seki Y. The relationship between second-order false belief and display rules reasoning: the integration of cognitive and affective social understanding Dev Sci 2009; 12(1 ): 150-64. Naito M. The relationship between theory of mind and episodic memory: evidence for the development of autonoetic consciousness J Exp Child Psychol 2003; 85: 312-6. Naito M, Koyama K. The development of false-belief understanding in Japanese children: delay and difference? Int J Behav Dev 2006; 30(4 ): 290-304. Perner J, Wimmer H. ‘John thinks that Mary thinks that …’: Attribution of second-order belief by 5- to 10-year-old children J Exp Child Psychol 1985; 39: 437-71. Banerjee R, Yuill N. Children’s understanding of self-presentational display rules: Associations with mental-state understanding Br J Dev Psychol 1999; 17: 111-24. Friederici AD, Rüschemeyer SA, Hahne A, Fiebach CJ. The role of left inferior frontal and superior temporal cortex in sentence comprehension: localizing syntactic and semantic processes Cereb Cortex 2003; 13: 170-7. Bornkessel I, Zysset S, Friederici AD, von Cramon DY, Schlesewsky M. Who did what to whom? The neural basis of argument hierarchies during language comprehension Neuroimage 2005; 26: 221-33. Martin I, McDonalds S. Exploring the cause of pragmatic deficits following traumatic brain injury Aphasiology 2005; 19: 712-30. Joannette Y, Champagne-Lavau M, Kahlaoui K, Ska B. The future of our knowledge about communication impairments following a right-hemisphere lesion In: Ball MJ, Damico JS, Eds. Clinical aphasiology Future directions A fest-schrift for Chiris code. Hove, UK & New York: Psychology Press 2007; pp. 284-98. Winner E, Gardner H. The comprehension of metaphor in brain-damaged patients Brain 1977; 100: 717-23. Côte H, Payer M, Giroux F, Joanette Y. Towards a description of clinical communication impairment profiles following right-hemisphere damage Aphasiology 2007; 21(6/7/8): 739-49. Stuss DT, Gallup GG, Alexander MP. The frontal lobes are necessary for “Theory of mind” Brain 2001; 124: 279-86. Surian L, Siegal M. Sources of performance on theory of mind tasks in right-hemisphere damaged patients Brain Lang 2001; 78: 224-32. Apperly IA, Samson D, Chavarino C, Humphreys GW. Frontal and temporo-parietal lobe contribution to theory of mind: neuropsychological evidence from a false-belief task with reduced language and executive demands J Cogn Neurosci 2004; 16: 1773-84. Segal M, Carrington J, Radel M. Theory of mind and pragmatic understanding following right hemisphere damage Brain Lang 1996; 53: 40-50. Apperly IA, Samson D, Carroll N, Hussain S, Humphreys GW. Intact 1st and 2nd order false belief reasoning in a patient with severely impaired grammar Soc Neurosci 2006; 1(3-4 ): 334-48. Champagne-Lavau M, Joanette Y. Pragmatics, theory of mind and executive functions after a right-hemisphere lesion: different patterns of deficits J Neurolinguist 2009; 22: 413-26. Carter R. Mapping the mind. Berkeley: University of California Press 1998. Moro A, Tettamanti M, Perani D, Donati C, Cappa SF, Fazio F. Syntax and the brain: disentangling grammar by selective anomalies Neuroimage 2001; 13: 110-8. Poldrack RA, Wagner AD, Prull MW, Desmond JE, Glover GH, Gabrieli JD. Functional specialization for semantic and phonological processing in the left inferior prefrontal cortex Neuroimage 1999; 10: 15-35. Kotz SA, Cappa SF, von Cramon DY, Friederici AD. Modulation of the lexical-semantic network by auditory semantic priming: an event-related functional MRI study Neuroimage 2002; 17: 1761-72. Brauer J, Friederici AD. Functional neural networks of semantic and syntactic processes in the developing brain J Cogn Neurosci 2007; 19(10 ): 1609-23. Saxe R. Uniquely human social cognition Curr Opin Neurobiol 2006; 16: 235-9. Ohnish T, Moriguchi Y, Matsuda H, et al. The neural network for the mirror system and mentalizing in normally developed children: an fMRI study Neuroreport 2004; 15(9): 1483-7. Dapretto M, Davies MS, Pfeifer JH, et al. Understanding emotions in others: mirror neuron dysfunction in children with autism spectrun disorders Nat Neurosci 2006; 9(1): 28-30. Wang AT, Lee SS, Sigman M, Dapretto M. Developmental changes in the neural basis of interpreting communicative intent Soc Cogn Affect Neurosci 2006; 1: 107-21. Wang AT, Lee SS, Sigman M, Dapretto M. Neural basis of irony comprehension in hcildren with autism: the role of prosody and context Brain 2006; 129(4 ): 932-43. Kobayashi C, Glover GH, Temple E. Children’s and adults’ neural bases of verbal and nonverbal ‘Theory of Mind’ Neuropsychologia 2007; 45: 1522-32. Moriguchi Y, Ohnishi T, Mori T, Matsuda H, Komaki G. Changes of brain activity in the neural substrates for theory of mind during childhood and adolescence Psychiatr Clin Neurosci 2007; 61: 355-63. Kobayashi C. Language and thought: linguistic influence on developmental neural basis of theory of mind In: Reed MA, Ed. Children and language: development, impairment and training. Hauppauge, NY: Nova Science Publishers 2008; pp. 3-30. Clancy PM. The acquisition of Japanese In: Slobin DI, Ed. The crosslinguistic study of language acquisition. Hillsdale, NJ: Lawrence Erlbaum Associates 1985; 2: pp. 373-524. Clancy PM. The acquisition of communicative style in Japanese In: Schieffelin BB, Ochs E, Eds. Language socialization across cultures. Cambridge: Cambridge University Press 1986; pp. 213-50. Saxe R, Wexler A. Making sense of another mind: the role of the right temporo-parietal junction Neuropsychologia 2005; 43: 1391-99. Talairach J, Tournoux P. Co-planar stereotaxic atlas of the human brain. Stuttgart: Thieme 1988. Siegal M, Varley R. Aphasia, language, and theory of mind Soc Neurosci 2006; 1(3-4): 167-74. Liu D, Wellman HM, Tardiff T, Sabbagh MA. Theory of mind development in Chinese children: a meta-analysis of false-belief understanding across cultures and languages Dev Psychol 2008; 44(2 ): 523-31. Lillard A. Ethnopsychologies: cultural variations in theories of mind Psychol Bull 1998; 123: 3-32. Lillard A. Ethnopsychologies: reply to Wellman and Gauvain Psychol Bull 1998; 123: 43-6. Perner J, Lang B. Development of theory of mind and executive control Trend Cogn Sci 1999; 3: 337-44. Carlson SM, Moses LJ. Individual differences in inhibitory control and children’s theory of mind Child Dev 2001; 72: 1032-53. Sabbagh M. Executive functioning and preschoolers’ understanding of false beliefs, false photographs, and false signs Child Dev 2006; 77: 1034-49. Samson D, Apperly IA, Kathirgamanathan U, Humphreys GW. Seeing it my way: a case of selective deficit in inhibiting self-perspective Brain 2005; 128: 1102-. Samson D, Apperly IA, Humphreys GW. Error analysis in brain-damaged patients with perspective taking deficits: a window to the social mind and brain Neuropsychologia 2007; 45: 2561-9. Corbetta M, Kincade JM, Ollinger JM, McAvoy MP, Shulman GL. Voluntary orienting is dissociated from target detection in human posterior parietal cortex Nat Neurosci 2000; 3: 292-7. Mitchell JP. Activity in right temporo-parietal junction is not selective for theory-of-mind Cereb Cortex 2008; 18: 262. Scholz J, Triantafyllou C, Whitfield-Gabrieli S, Brown EN, Saxe R. Distinct regions of right temporo-parietal junction are selective for theory of mind and exogenous attention PLoS One 2009; 4(3 ): e4869. Baldwin D. Infants‘ contribution to the achievement of jint reference Child Dev 1991; 62: 875-90. Baldwin D. Early referential understanding: Infants‘ ability to recognize referential acts for what they are Dev Psychol 1993; 29: 832-43. Tomasello M. Reference: intending that others jointly attend Pragmatics Cogn 1998; 6: 229-43. Carpenter M, Tomasello M. Joint attention, cultural learning, and language acquisition: implications for children with autism In: Wetherby AM, Prizant BM, Eds. Autism spectrum disorders: a transactional developmental perspective. Baltimore: Paul H: Brookes Publishing 2000. Siegal M, Frank CK, Surian L, Hjelmquist E. Theory of mind and bilingual cognition In: Cook V, Bassetti B, Eds. Linguistic relativity and bilingual cognition: a different way of thinking. New York: Psychology Press 2010.